Lloyd and Noah Graff are on vacation this week. Here is a favorite Swarfblog from July 10, 2015. Americans on average spend 7.4 hours staring at a screen of some kind every day, according to Kleiner Perkins analyst Mary Meeker. That breaks down to 147 minutes watching TV, 103 minutes in front of a computer, 151 minutes in front of a smart phone and 43 minutes in front of a tablet. The U.S. is ranked 6th in world in screen time consumption—Indonesia and the Philippines are at the top of the list. I’m sure I spend at least an average of 7.4 hours of screen time daily, and I don’t even own a TV. Working a salaried office job, I have a computer screen in front of me most of my day. Fortunately as a machinery dealer, I get to spend time in my day in the shop amongst folks doing physical labor. When I’m not in the office, I’m often on my iPhone 6 Plus, surfing the Web, perusing Facebook, and incessantly checking my three email addresses (two for work, one personal). I have refused to download any mobile game apps, as I am already way too distractible. Following work, I spend the next few hours commuting, then working out in some form, and then eating. After dinner I often get back on the Web with my laptop or phone, sparingly streaming a sporting event, a Netflix show or The Daily Show. I also may write the occasional blog for Today’s Machining World or edit a movie—more screen time and more screen time. Not having a TV helps me cut down a little on the screen time, but as you can tell, I still can’t escape the screens. I’m bothered by all the screen time. I don’t think it’s healthy. It’s not natural. I think it’s really sad when you’re at dinner and people can’t stop looking at their phones, even during a conversation. Remember the days when people could debate a subject at dinner and not instantly settle their dispute by googling the answer? Remember when you had to consult an expert or even go to the library the next day to resolve your question? The constant email checking is definitely one of the most significant effects of smart phones on me. It means that for me and millions of folks around the world our jobs follow us EVERYWHERE all the time. I accept this as an essential reality of my job as a machinery dealer. Often the most important emails or calls come from Europe or who knows where at 6:00 a.m., interrupting my normal slumber before my usual 7:45 a.m. alarm time—I know, that’s late for most people in the manufacturing biz. I hate to say it, but often when my iPhone alarm goes off in the morning I get myself going by checking my work email as I still lie under the covers. 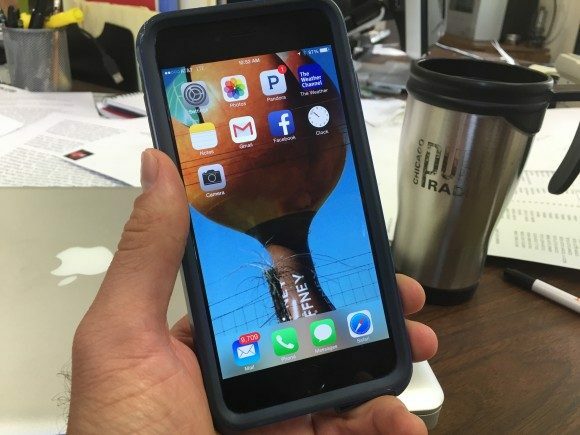 Noah Graff’s iPhone 6 Plus that follows him everywhere. Also, I often find myself texting or talking about business with my dad/boss on the phone several nights during the week, and he texts me in the morning before my alarm goes off as well. I don’t mind it—usually. If we are talking about something business related in after hours it often means something interesting is happening, generally something more positive than negative. If it’s negative I usually will tell him we should deal with it the next day. I’m on salary, so this is the routine I signed up for. But for people who get paid by the hour smart phones complicate things. When does writing emails on your phone after work constitute overtime? When does it just mean being a responsible employee? If we are all working from everywhere, all the time, does the traditional vacation format of a set number of days become obsolete? Netflix began giving employees as many vacation days as they wanted back in 2002. Today 1% of American companies offer unlimited vacation. Believe it or not, many employees don’t like “unlimited vacation time” or they end up taking less vacation because of the privilege. People become overwhelmed by the choice of how much time to take off, causing them to feel indecisive and take less vacation. Also, some employees may feel guilty or self-conscious if they take more vacation than their peers. People have been working “overtime” from home for decades, centuries probably. But today we have those damn smart phones. Those damn beautiful, powerful, multipurpose devices that fit in our pockets. Are they enslaving us? Are we really better off with them? Question 1: Do you prefer living in a world in which we all have smart phones? Question 2: Do you wish you could choose how much vacation time you receive in your job? First… love that the Gaffney peach is your iPhone wallpaper! Question 1: As a person who wanted to grow up and become a library research assistant (I used to LOVE calling the library with random questions and having the lady either give me the answer right away, or call me back with the information), I LOVE having a world of knowledge at my fingertips with my iPhone X. I DO put it down when with friends/family–especially when at the dinner table. Believe it or not, I recently had to tell my 77-year-old mother to put HER phone down, because she was playing a video game while visiting with me! Question 2: I would be horrible at choosing my own vacation time. I get 25 days at Okuma, and I struggle to use them all. I’m always thinking, “Well, I have that important meeting.” or “When that project is done, I’ll take time.” I have to diligently plan to make sure I use the time I deserve. Reading email in bed? I am guilty of that as well. Thanks for the fun article, Noah! #1) I have aa smart phone only because my ole flip phone died. I don’t need a smart phone because I’m stupid. I just needed a phone for emergencies. I don’t even know how to use must of it’s features. #2) Would just like to have got the vacation I was promised. Every time I got a vacation scheduled, they needed me to re-schedule. I got seriously behind and ultimately lost about 9 weeks of vacation time. I was salaried, so not much you can do. It would be fair to say that every time an employer demands you to reschedule, it ought to be an automatic $1500 plus losses for tickets / reservation costs. An employer that steals from it’s employees really sticks it to their customers. 1: Though handy in certain situations, smart phones are also a big time waster for me. I’m sucked into reading news stories about whatever when I could be making better use of my time either getting stuff done (chores, dinner) or engaging with my kids. I feel guilty for getting sucked in. 2: The company where my husband worked went from having a fixed vacation time to “unlimited” and then back again to fixed. He got screwed by it because he had a lot of vacation time accrued before the switch to unlimited, but didn’t end up taking much that year. When they switched back, they didn’t count previously accrued vacation and started everyone over from zero. I would rather have a fixed number of days off. You will all be shocked to see that the world continues on just fine without when you retire. Don’t take yourself so seriously.